Wild Nature Photo Adventures arrange tours that as far as possible can be classed as ecotourism. This implies traveling in an ecologically and economically conscious fashion. Therefore, we cooperate primarily with local photographers, tour operators, guides, drivers and hotels/lodges so that the major part of our economical cooperation will benefit local communities. We have local partners that promote conservation and environmental consideration such as waste sorting, water purification and staff training. Furthermore, for each tour we contribute economically towards the protection of the areas we visit. We select reserves, nature areas and National Parks that are protected for visitors, just like us. Traveling in small groups is an advantage, not only for the participants, but also for the areas we visit. Our knowledgeable and experienced tour leaders are a priceless resource when it comes to mediating knowledge and contact with the nature and local community we encounter. Safari guides waiting outside of Bandhavgarh National Park, India. Anti poaching patrol in Kruger National Park, South Africa. Great news! India’s environmental minister has now published new figures for the country’s Tiger population. An increase by 30% from 1706 to 2226 individuals. Important news that shows that it pays for governments and NGO’s to take action against poachers, to improve reserves, parks and corridors and to support education. At Wild Nature Photo Adventures we take pride in supporting a great organisation, TOFT (Travel Operators for Tigers) that channel and activate money that tiger tourists pay to experience the great Indian nature. If you would like to contribute to save the Tiger, join us on our Indian Tiger tour. A unique tour with few participants, great National Parks and as much time as possible to search for Tigers! Read more about TOFT here..
Tigers from Kanha National Park. 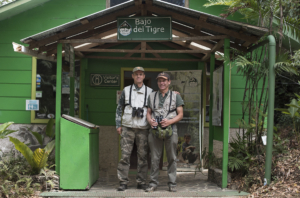 Jan Pedersen is co-owner and tour leader with Wild Nature Photo Adventures, and has visited this rainforests in the cloud-clad mountains of Monteverde in Costa Rica. From being an area of highly degenerated forest, it is now a pleasure to walk in the forest and see the trees that have grown back, and attracted the animals. The area is situated next to the world-famous rainforest reserve Monteverde, the Santa Elena reserva and Arenal Volcano National Park. In all, it is an enormous area of biological importance, with high biodiversity, and is very important for the local climate and water supply in the country. We always visit the Children’s rainforest and Monteverde several times during our best-selling Costa Rica tour. ”In 1987, Swedish teacher Eha Kern and her young students in Fagervik, Sweden became concerned after viewing a documentary that ended with disturbing images of tropical rainforests being burned and cleared. Eventually, children in 44 countries contributed to the effort they started. Our tour leader together with a local guide at the Childrens rainforest. Resplendent quetzal in the rainforest. Italy’s nature is so rich and diverse, shaped by geology and the Mediterranean climate with dry, hot summers and rainy winters. The North is characterized by the impressive Alps, with peaks over 4000 m. Further south there are plains formed by the Po River. The Apennines form the backbone of the country, with the most untouched nature. Today, there are 24 National Parks and an extensive system of corridors in between. The number of reserves is increasing, especially as the old grazing and agricultural landscape is getting overgrown. We support WWF Italy, who are active all over the country and actively work to form new reserves and protected areas. They have also established successful action plans against catching small birds and former years brutal and intense hunting. The nature of the USA is so beautiful and diverse, with many protected areas, such as National Parks and reserves. The USA is also heavily exploited where humans have fragmented many of the natural links in the landscape. This lack of cohesive natural areas and dispersal corridors for plants and animals is a problem, both in the US and elsewhere in the world. The Yellowstone to Yukon Initiative (Y2Y) works with connecting natural areas. The organization is a collaboration between Canadian and American NGO’s. The region, from Yukon in the North to Yellowstone in the South, is North Americas great ”conservation opportunity”. It is one of the last remaining relatively pristine mountain ecosystems on Earth. The animals and plants here were common in the US when the first European settlers arrived. The area is the source of clean drinking water for 15 million North Americans. In order for these species to remain and for the ecosystem to continue producing services such as drinking water for us humans it is important that more than small islands of nature are protected. Areas must be larger and provide good dispersal opportunities. We believe that Y2Y does very important work, and as we have tours in the region, we want to support the organisation economically.